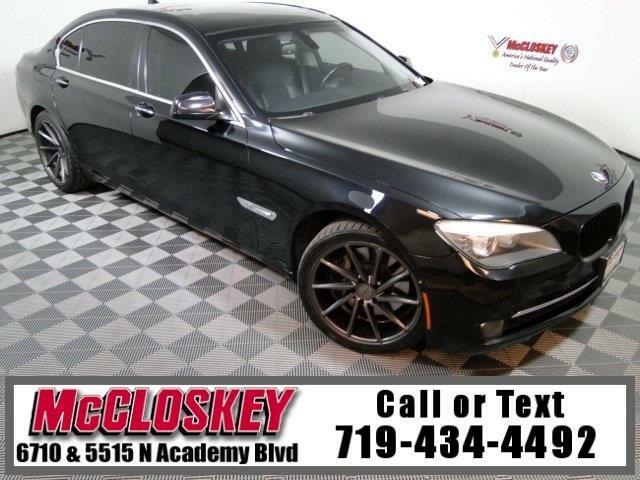 Truly Impressive 2011 BMW 750LI All Wheel Drive Long Wheel Base with Navigation System, Heated and Cooled Seats, Adaptive Cruise Control, Power Moon Roof, Heated Steering Wheel, Keyless Entry, and Premium Sound System! The 750i adds a power trunk lid, full keyless ignition/entry, soft-close automatic doors, 14-way "multicontour" front seats with adjustable lumbar and side bolsters and upgraded leather. The 2011 BMW 750Li is powered by a 4.4-liter twin-turbo V8 that produces 400 hp and 450 lb-ft of torque. Compared to other luxury sedans like the Lexus LS 460, the 2011 BMW 7 Series is more athletic, and offers impressive vehicle control from behind the wheel! This vehicle passed our 110 multi-point inspection and is backed by our National Quality Dealer of the Year Award. We are an ''A+'' Better Business Bureau Rated Business. We offer low interest rate financing, low down payments and the highest trade allowances in the state! Here at McCloskey we do things a bit differently, we shop our competition every day to ensure a great value to you. Come on down and experience it for yourself. This McCloskey Assured vehicle includes a Vehicle History Report!! At McCloskey we strive to provide ASSURANCE, TRUST, VALUE AND QUALITY! Call 719-434-4492.